Usnea (Usnea lapponcia) is a wispy little lichen that doesn’t look like much but in the medical lab, it has demonstrated its strength! Usnic acid, the main constituent of Usnea, has been extensively studied as an antibiotic that inhibits 16 known gram-positive bacteria (both the resistant and non-resistant strains) including streptococcus, staphylococcus, and mycobacteria. Usnea is used for acute and chronic lung infections, such as pneumonia, colds and flu, and as an adjunct to tuberculosis (TB) treatment. Usnea appears to kill bacteria by disrupting their metabolic function, cutting off energy supply to the cells. Unlike bacterial cells, human cells are less permeable to usnic acid and are not adversely affected. So let’s give Usnea the top shelf rating it deserves! 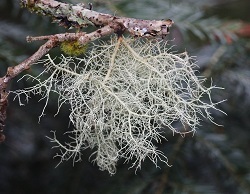 Noteworthy: Usnea is sensitive to air pollution, especially sulfur dioxide, a by-product from combustion of petroleum and coal. The Usnea harvested for this tincture is from a pristine area, at an altitude of 5,000 feet, isolated from sulfur dioxide pollution.